Working with the brand and marketing team at PlayStation we generated moonshot concepts for a future mobile app. The PS4 system dominates the gaming console market but as more services move into the cloud, PlayStation is looking for new and innovative ways to engage users in the mobile space. Our app concepts imagined ways to connect gamers with the content, news, and people they care about while rewarding in-game action through the mobile experience. Design an app experience that will engage PlayStation console users in the mobile space. How can we create value for users in an app that promotes the brand and leverages the gaming experience? Create an app that is customized for each gamer type. Rewards user interaction with content that brings them back to the console. Connect player with the news, games, and users they like. Six interactive vignettes that demonstrate different ways of engaging users, rewarding console gaming, consuming news, generating content, and connecting with other gamers. How do we create a personalized player profile with meaningful information? Give users an analytics dashboard for users to see a breakdown of their gaming habits. Allow users to join tribes where they can get news and connect with other gamers that play the same way they do. How do we get users to create and consume content? Using the same reward system as trophies we can give users additional ways to earn points through consuming content, starting free trials, and contributing tips and reviews. How do we create a more immersive news experience? Game news is a matter of personal preference and it can suffer from a lack of signal to noise. By pulling in news from outside sources and allowing users to choose their favorites we can create a customized gamer news feed. 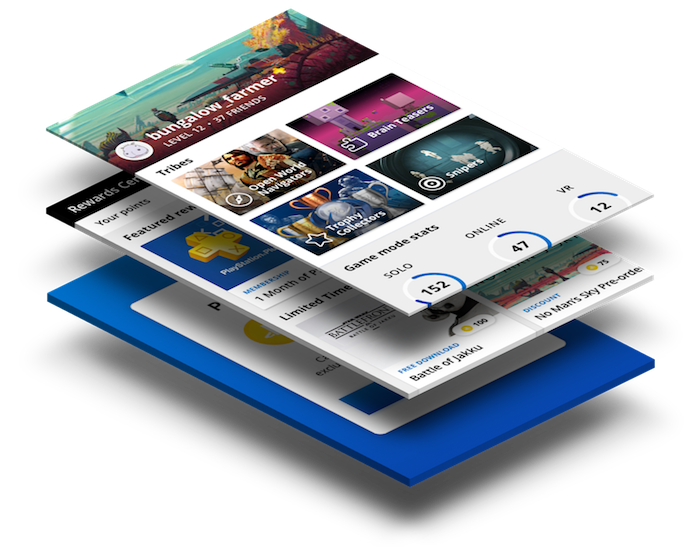 We can also gamify the experience of consuming this content by rewarding users for watching trails, reading articles, or commenting on content. How do we gets users to review games? Reviewing games should be fun. We’ve created a simple flow to demonstrate a painless a la carte approach to game reviews where users interact with optional elements to build a comprehensive game profile. Naturally users will also be rewarded with points for their hard work. How do we keep users invested with the app? Points are only as good as the rewards they unlock. The rewards marketplace would allow users to cash in their points for free PlayStation Plus game time, exclusive content, or limited edition game titles. How do we trigger users to return to the app? Gamers earn trophies for various achievements while playing games on the console but those trophies don’t convert to any tangible value outside of the game. By allowing users to redeem their trophies for rewards in the mobile app we can drive engagement on both platforms.